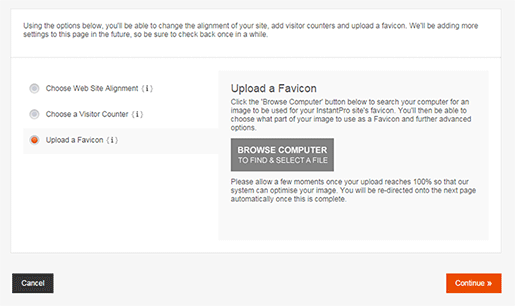 To choose your Site Alignment, add a Visitor Counter and upload a Favicon to your web site you will need to click the Edit Miscellaneous Settings button highlighted in the image below. After you have clicked this, you will see the screen as shown in the image below. 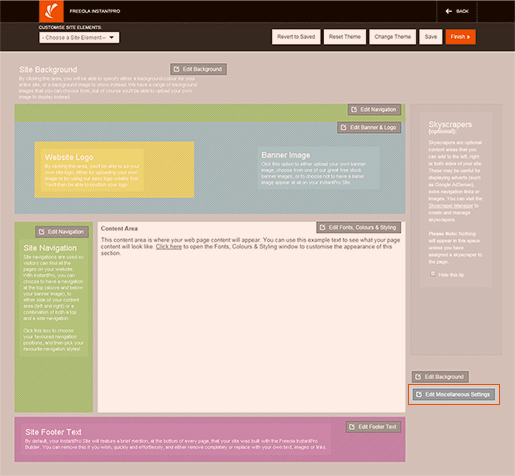 The first choice you have is to set the Alignment of your web site. Similarly to how you would align text, this option allows you to do the same with your web site. You would choose to Align Left so that your web site is displayed to the left when viewed in an internet browser. For central alignment choose Align Center and for right alignment select Align Right. Once you have selected the alignment, you will then be able to select the next option, Choose a Visitor Counter. 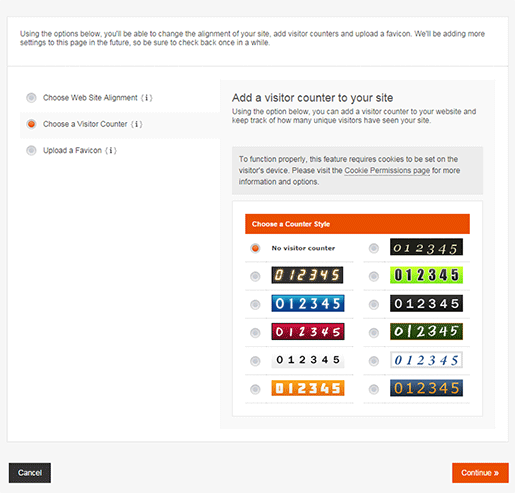 There are a number of free visitor counters (also known as 'Hit Counters'), available in InstantPro from which you are able to choose for your web site. 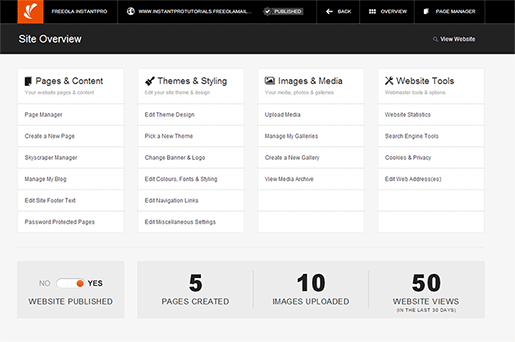 For the tutorial example the option selected is No Visitor Counter, but you can add a free counter simply by selecting one on this page. A visitor counter will display at the bottom of your web site and will indicate the number of visits your site has received. A Favicon is a small image which displays next to the web site address in the address bar of your web browser, if you look to the top of the page you will see the Favicon that Freeola uses for our web site. As you can see, the F within the red square is the Freeola.com Favicon. To add your own Favicon to your InstantPro web site, you will need to select the third option on the miscellaneous settings page, where you will be able to upload your own Favicon image. The image you upload for your Favicon must be quite small so that it can fit in to the available space within the address bar of the internet browser. Once you have uploaded your Favicon, you will be given the option to crop the image if it is over the allowed size. As you can see from the image above the image uploaded for the tutorial example is a little too large to be used as a Favicon, so it must be cropped. 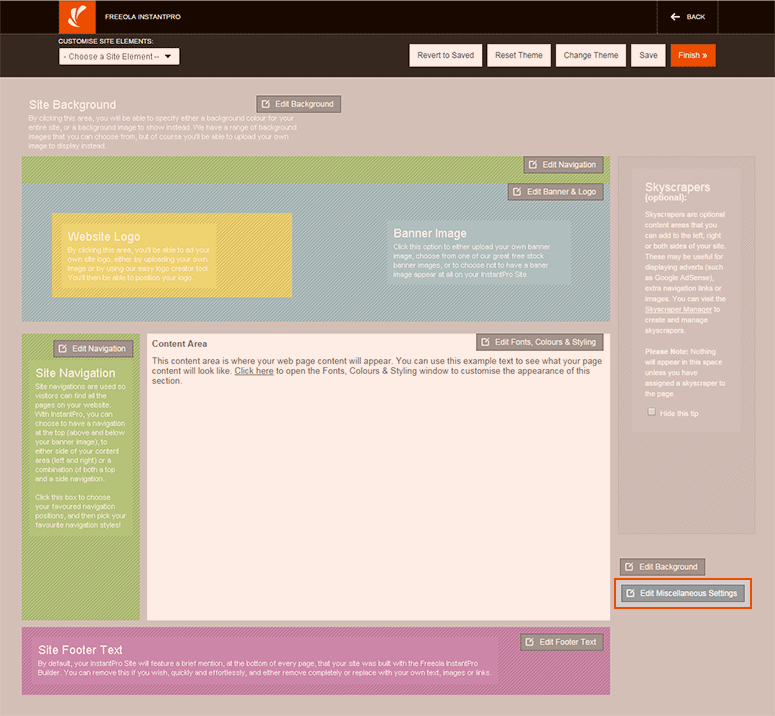 The content within the squared area is that which will be used for the web site Favicon. You will need to ensure that you are using the correct part of your image. Once you have selected the part of the image you wish to use as your Favicon click the Continue button. If you are unhappy with the preview, you will see that you are able go back and crop the image again, or you can upload a new image to use as the Favicon. If you are happy with the preview click the Use Image & Finish button shown in the bottom right which will take you back to the web design editor.